New York Times bestselling author Todd Johnson McCaffrey grew up in the world of science fiction and fantasy, being the middle son of the late Nebula Grandmaster, Anne McCaffrey. He first discovered science fiction with Space Cat and was surprised (and delighted) to discover that his mother was also writing it. He learned to type at 12 in order to earn his first typewriter so that he could start writing on his own. Between sidetracks into the US Army, board gaming, software engineering and parenthood, he continued to write, making his first sale in 1986. 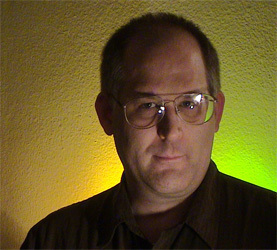 He has collaborated on five Dragonriders of Pern novels, written three solo Pern novels, and has written numerous short stories, written animation screenplays, designed board games, and has written and edited seveal non-fiction works. He is studying for a Master of Fine Arts at Claremont Graduate University.